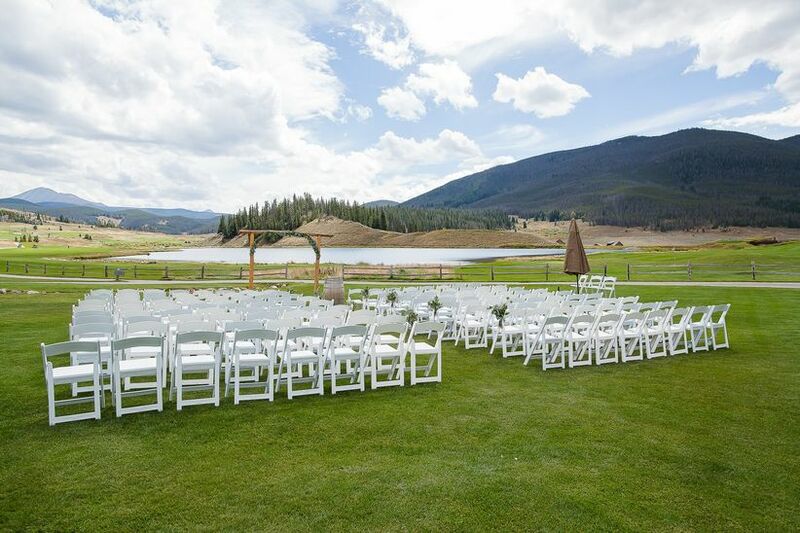 Find the perfect view for your big day at these scenic and amazing Colorado mountain wedding venues. If you’re in the market for Colorado mountain wedding venues, a breathtaking view is probably at the top of your “must have” list. After all, the Rockies are some of the most scenic mountains in the country, whether you’re tying the knot at the top of a stunning peak or sipping cocktails with mountain ranges on the horizon. 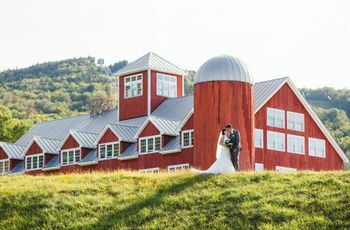 From rolling fields to black tie ballrooms, Colorado mountain wedding venues have something for everyone. 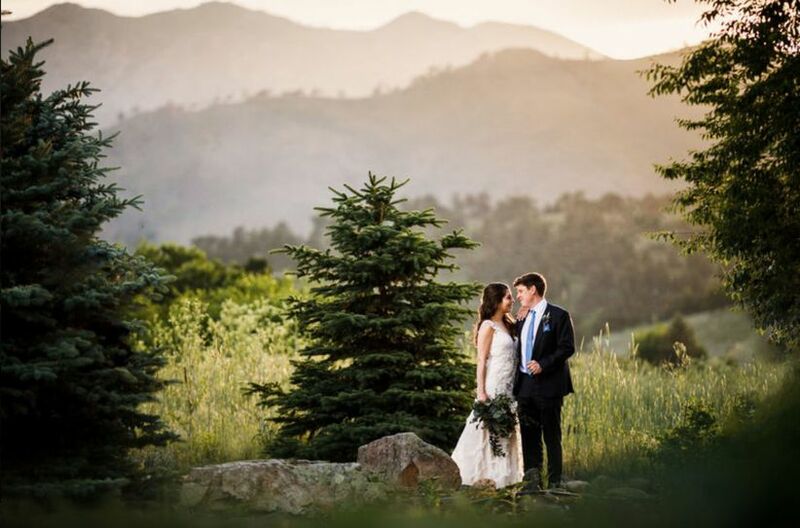 Head to the hills for a rustic celebration at high altitude, or celebrate in the city at one of the many beautiful Denver wedding venues. 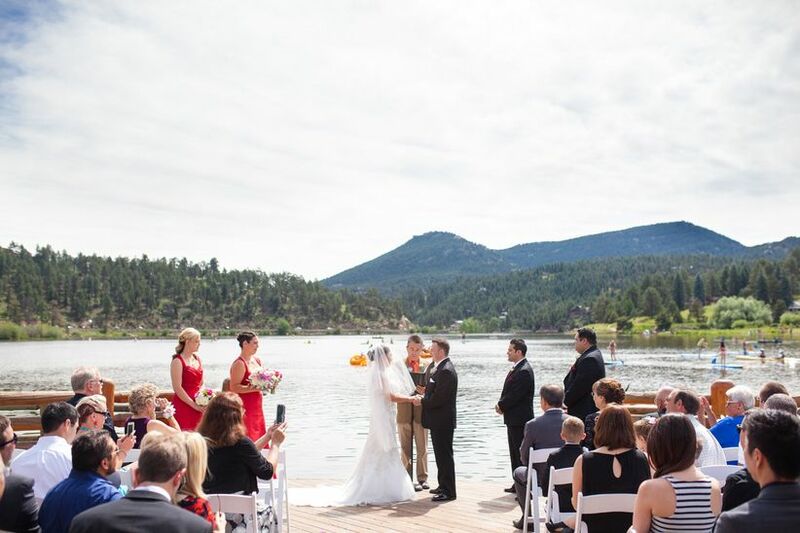 Colorado brides and grooms, here are 12 outdoor wedding venues you won’t want to miss. 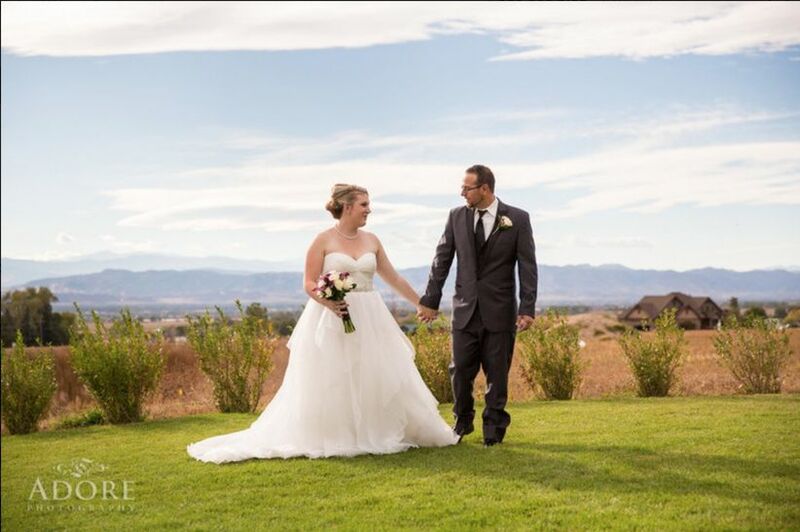 Why just look at mountains on your wedding day when you can be completely surrounded by them - only 30 minutes outside of Denver? This sprawling log cabin lodge features a great room with a stone fireplace and space for up to 200 guests, plus a deck overlooking Evergreen Lake and nearby Bear Mountain. Available year-round, you’ll have your choice of snow-capped peaks, colorful wildflowers, or autumn’s golden aspen trees as a picturesque backdrop. This contemporary, family-owned venue offers some of the best views in Northern Colorado. 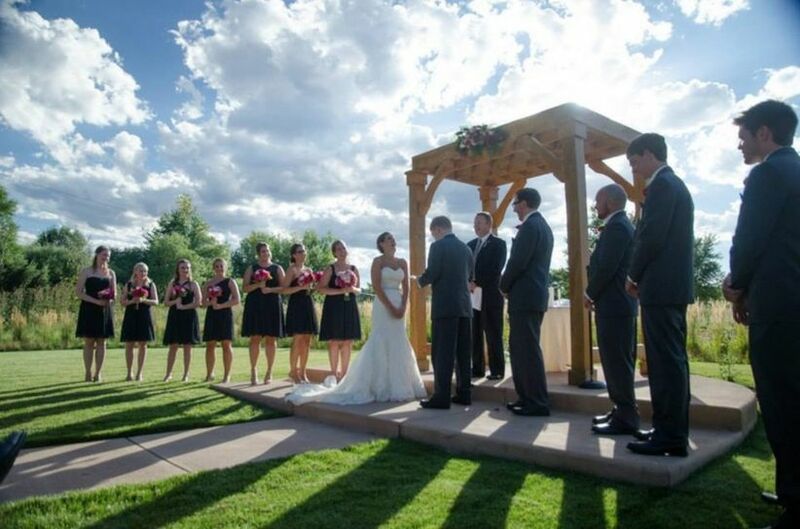 Perched above Fort Collins and facing west toward the Front Range, the garden is perfect for an open-air ceremony. Inside, the sleek reception hall has towering windows that frame the Rockies, whether for a seated dinner or an indoor ceremony. The flexible space can be transformed for an intimate celebration or a 300-person crowd. On-site VIP suites give the entire wedding party a comfortable place to get ready that’s right in the action, with spacious makeup stations in the bridal suite and video games in the groom’s retreat. 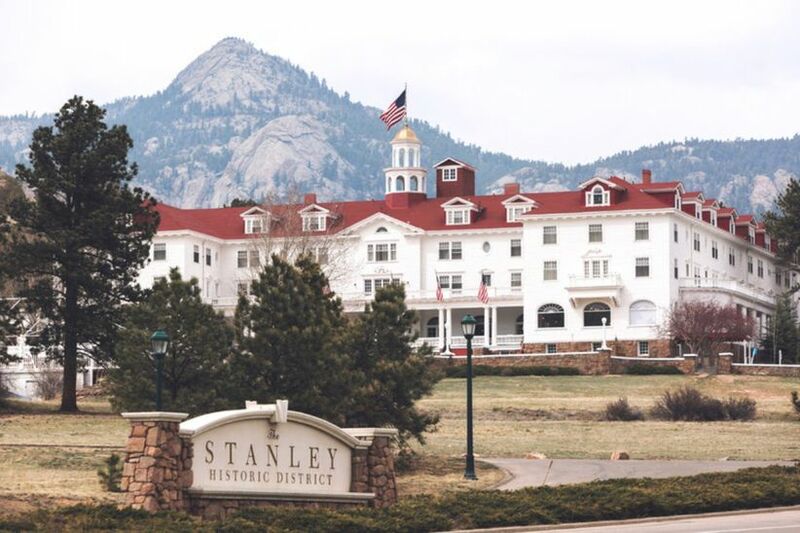 This historic Estes Park property has not one, not two, but nine options for wedding venues, from the small and intimate to the sweeping and grand, all offering windows, verandas, and mountain views. 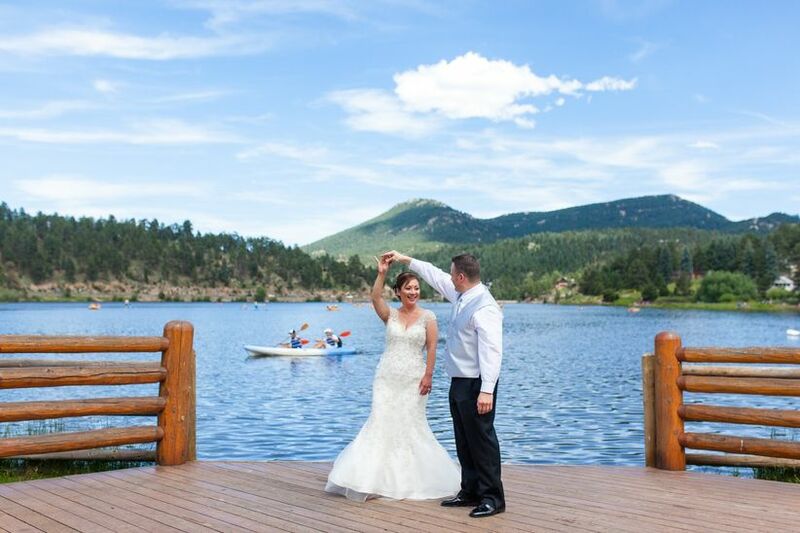 The hotel’s manicured front lawn offers breathtaking views of Longs Peak and Lake Estes, while the newly built Pavilion has a 250-seat auditorium with a dramatic glass wall that opens to wrap-around patio and a fresh and sunny event space with views of Rocky Mountain National Park. Invite guests to join you in the hotel’s cozy rooms, sip cocktails at the Whiskey Bar, or learn about the hotel’s, ahem, other-worldly guests Night Spirit Tour. Built in the late 1800s, the Greenbriar Inn is a 50-year-old restaurant set on 20 pristine acres. Italian hand-painted chandeliers and a stone fireplace light the Upstairs Dining Room, with French doors that lead to a mountainside balcony. The property has three gardens, where the team grows vegetables and herbs that are featured in mouthwatering seasonal menus. 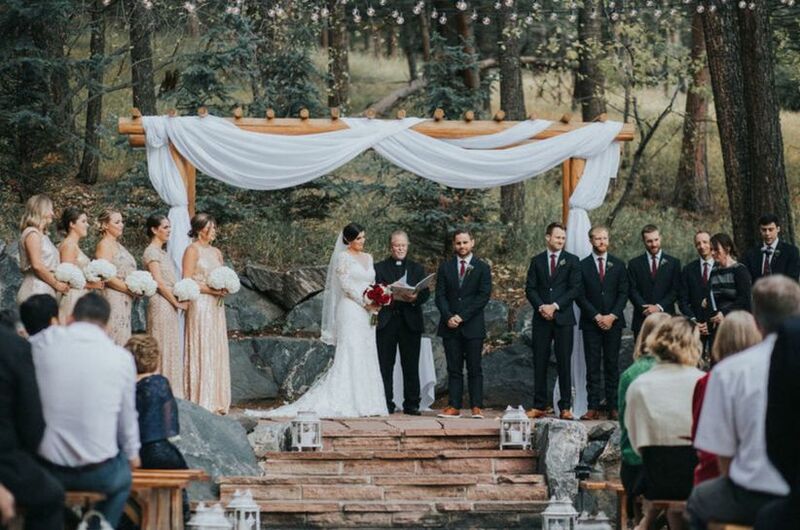 The highlight, though, is the Cabin Lawn, where outdoor ceremonies are set amongst 14 acres sprawling fields and woodlands, with Left Hand Canyon in the background. Just 30 minutes south of Denver, this 90-acre property mixes mountain elegance with bucolic charm. The manicured Events Lawn is set alongside the pristine red and white Carriage House, overlooking rolling fields as the Rockies rise in the background. 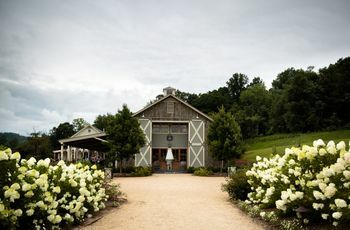 The Carriage House Ballroom features white pine walls, towering ceilings, and floor-to-ceiling barn doors that open to reveal nearby peaks and let in the mountain breeze. Or follow the stairs up the turret to Lola’s Loft, where wagon wheel chandeliers light red oak floors, and loft doors open for stargazing and unobstructed Rocky Mountain views. There’s no better way to have mountain views at your wedding than to say “I do” at over 10,000 feet. 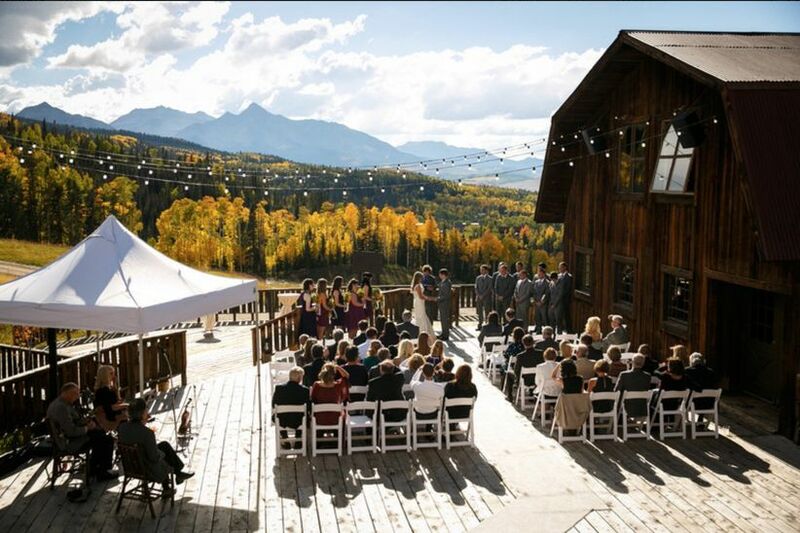 All of Colorado’s resorts offer beautiful on-mountain wedding venues, but Telluride’s are not to be missed. Board the gondola for a scenic trip to Allred’s or San Sophia Overlook, where aspen trees make way for towering fourteeners. At Allred’s, enjoy acclaimed American cuisine in a gorgeous stone-and-wood space with uninterrupted mountain views. 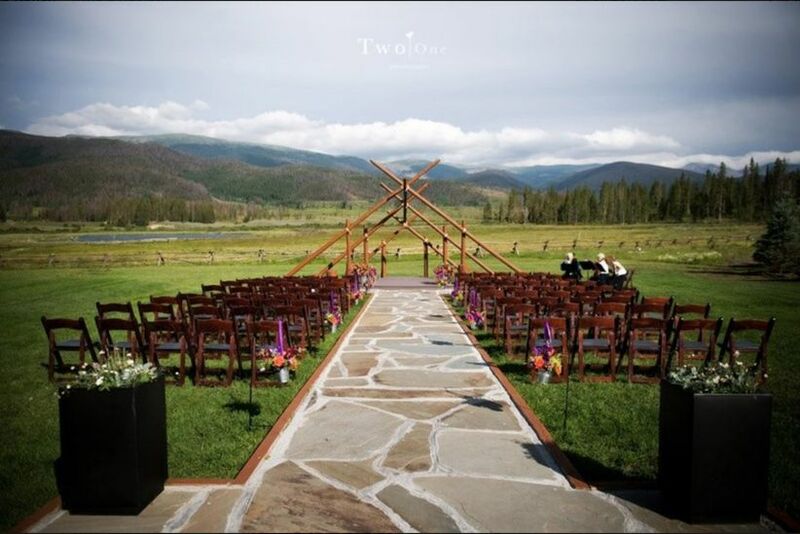 At San Sophia Overlook, exchange vows in a natural grass amphitheater - literally on a ski run! - before heading back to town for your reception. Perched at mid-mountain is Gorrono Ranch, where multi-level decks are perfect for a casual cocktail hour or late-night s’mores around the fire pit. If the snow is falling, you can even make your getaway as newlyweds on a snowcat through the spruce forest! 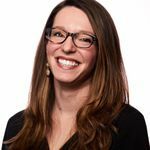 As you head west from Denver, it seems like you’re surrounded by Colorado mountain wedding venues. Piney River Ranch puts you right in the heart of it all, 12 miles north of Vail. 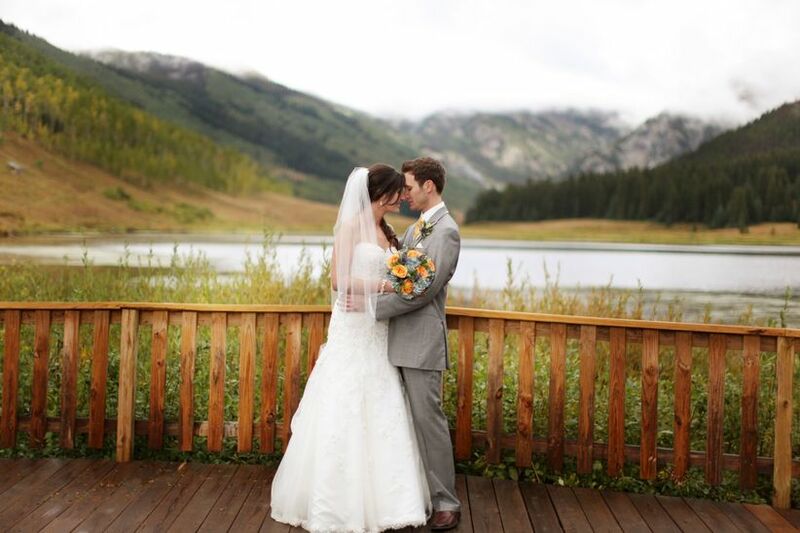 This log ranch-style venue is set alongside a crystal lake, all tucked beneath the Gore Range. The spacious pavilions offer Western charm (think whiskey barrel cocktail tables and vintage skis on the walls), whether you opt for an open-air reception or a cozy indoor celebration. Four cabins, a yurt, and three glamping tents are perfect for camping out before and after your wedding day. “Ranch-style” dining includes dishes like house-smoked trout and Colorado beef brisket. As your guests look out over Piney Lake, making s’mores around the fire, they will be blown away by the way the peaks glow as the sun sets. Give your guests a taste of the Colorado frontier as they gaze up at one of the state’s most beloved ski resorts. This 1930s homestead has been transformed, pairing a manicured golf course with award-winning fine dining. The cabin-style venue can accommodate 120 guests in the winter as you exchange vows in front of the floor-to-ceiling stone fireplace, and up to 180 in the summer with ample room for outdoor ceremonies before you come inside for dinner and dancing. Treat your guests to an indulgent meal focused on sustainable practices and locally-sourced products (paired with a killer wine list! ), and don’t forget to wander amongst the historic cabins and out-buildings scattered across the golf course for photos! Want to get married in a Civil War-era barn overlooking the Continental Divide? Devil’s Thumb Ranch has you covered. This 6,000 acre ranch (surrounded by untamed wilderness) is a true taste of the Old West - with a few modern amenities thrown in. The Broad Axe Barn is a 2,900 square foot reception space that can fit up to 160 guests. Or, take over High Lonesome Lodge’s 31 guest rooms and reception space for up to 350, including a wall of windows overlooking the mountains and grazing horses. For a smaller group, the Timber House has 240-degree views, an expansive deck, and space for 40. 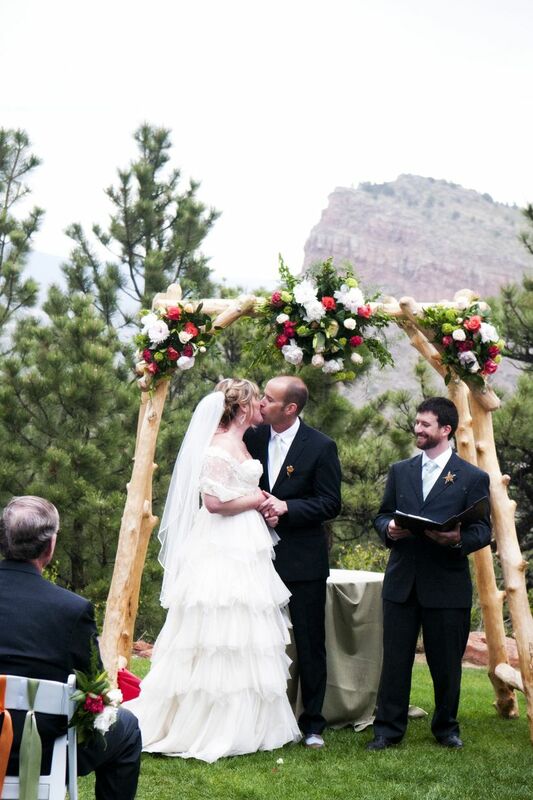 And don’t miss the Ranch’s iconic ceremony site, a log-and-rope arch overlooking the fields. 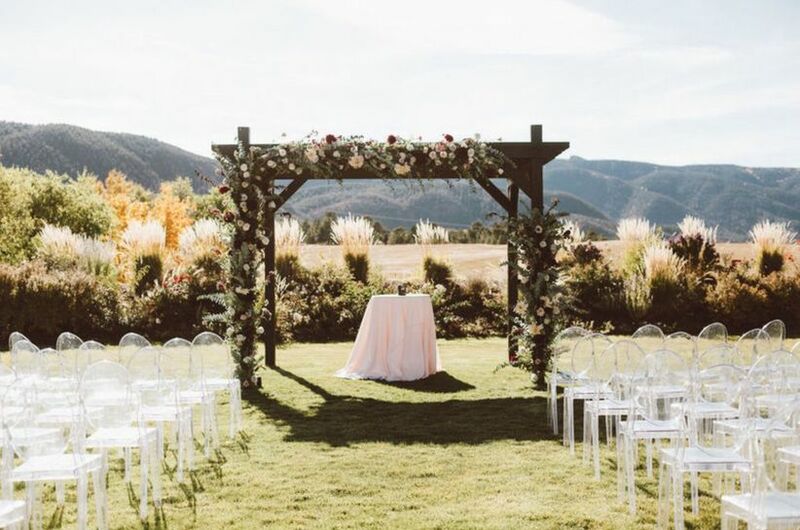 Located in the foothills of Golden, this venue features stunning views of the mountains, both indoor and outdoor venues, an on-site planner, and extensive rental services. 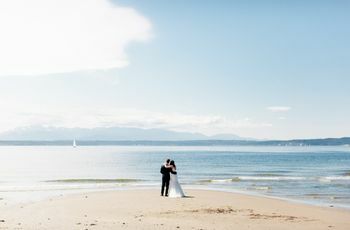 There are three wedding spaces to choose from, including the Ceremony Garden which can accommodate 240 guests for both a ceremony and standing reception. 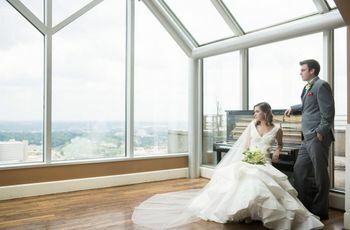 The Vista Room boasts floor-to-ceiling windows with banquet and ceremony seating for 240 guests. If “surrounded by trees” describes your ideal wedding, you’re in luck. The aptly named Pines at Genesee is located 18 miles west of Denver in Golden, Colorado. Voted one of our favorite venues for nature lovers, The Pines is a massive 12,000 square feet with two floors and outdoor space create the perfect atmosphere for your wedding.